He’s the trendiest president of the year (sorry Obama)… Old Abe appeared twice on the silver screen this year, first as a vampire slayer and later, as himself, brilliantly portrayed by actor Daniel Day Lewis. Lincoln has truly permeated pop-culture – We’ve even met a distinguished-looking dog and a couple of babies named Lincoln this year. Looking to celebrate the legendary Lincoln, imbibe in crafty cocktails and devour inspired American cuisine? Head to Lincoln (the restaurant) located just off Thomas Circle. The floor is comprised of laminated pennies and the ceilings are adorned with glowing mason jars. You’ll feel warm, fuzzy and American upon taking your seat. Plus they have great outdoor seating to boot. 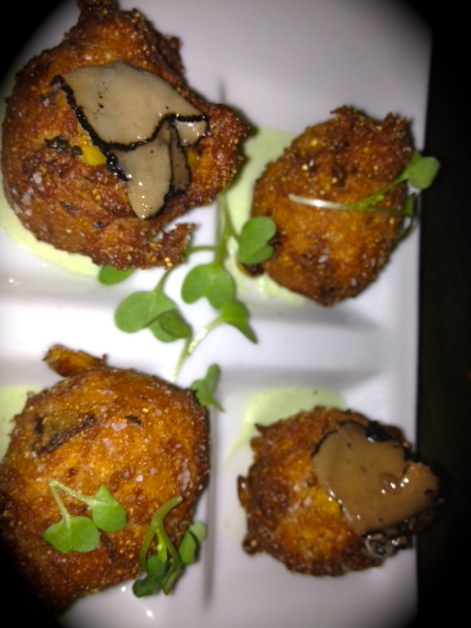 The Best Thing on the Menu: Truffled Corn Hushpuppies happened to be a special addition to the menu the evening we dined. But, not to worry, hushpuppies are always a menu staple, usually in the form of Maryland Crab Hushpuppies with Mustard Chive Aioli (also BTM worthy). These hot fried corn cakes are so good that they conjure up memories of the county fair and the best funnel cake you ever ate. Hushpuppies are actually a food attributed to hunters and fishermen from years ago who would fry some basic cornmeal and feed it to their dogs to “hush the puppies” during meals or festivities. Typical hushpuppy ingredients include cornmeal, wheat flour, eggs, salt, baking soda, milk or buttermilk and water. They may include onion, scallion, garlic, whole kernel corn and peppers. Here’s a recipe if you want to give it a whirl. Going on vacation and want to nosh on hushpuppies? Simply ask for “festivals” in Jamaica or “sorullitos” in Puerto Rico. We can’t say enough good things about Lincoln. It’s our go-to place when visitors come to town. Other can’t-be-missed items include the Chicken Pot Pie, Duck Sausage, Charred Grape Risotto and Braised Short Rib. Feeling adventurous? Drink in the nutrient-packed Gettysburg Address cocktail. Hushpuppies not your BTM? Post your favorites in the comments section. This entry was posted in Restaurants and tagged Best Thing on the Menu, BTM, Duck Sausage, Hushpuppies, Lincoln, Old Abe. Bookmark the permalink.